Do you know that song that goes, “Anything you can do, I can do better!…”? I always think of that song when I am deep frying, except I change it to, “Anything you can make, I can make better… by deep frying.” Perhaps not as catchy, but I’m not wrong! Fried pickles are a popular appetizer found at sports bars and restaurants. 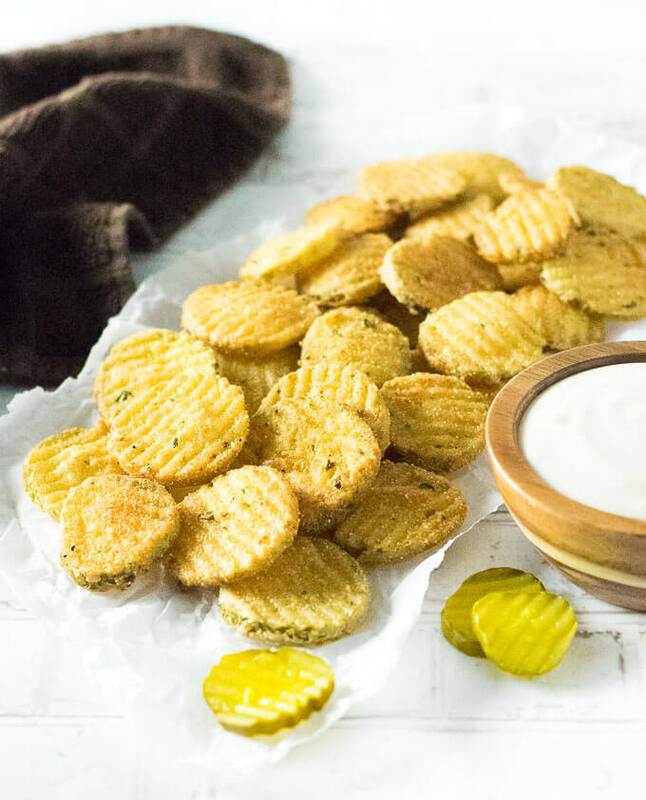 This easy appetizer is simply dill pickle chips coated in a thin batter and deep fried until golden brown. This is must try for any pickle lover. 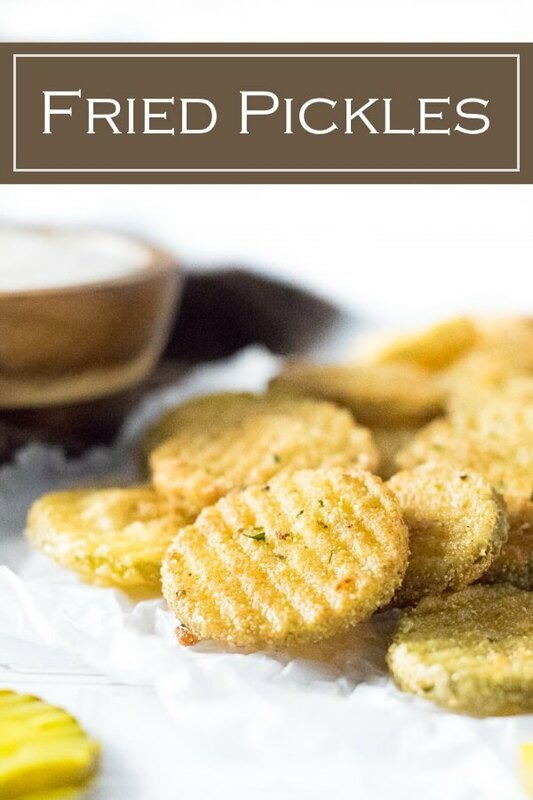 Fried pickle recipes call for a variety of batters ranging from flour, cornmeal, panko breadcrumbs, or even beer battered like my deep fried cheese curds. However, the batter that I find most closely resembles what I am served in restaurants is a mixture of flour and cornmeal. The flour helps give it a nice even coating, while cornmeal adds great texture. This is the same batter base I use for my fried green tomatoes as well. I also recommend adding seasoning to the batter, otherwise, the fried pickles will taste a bit bland. 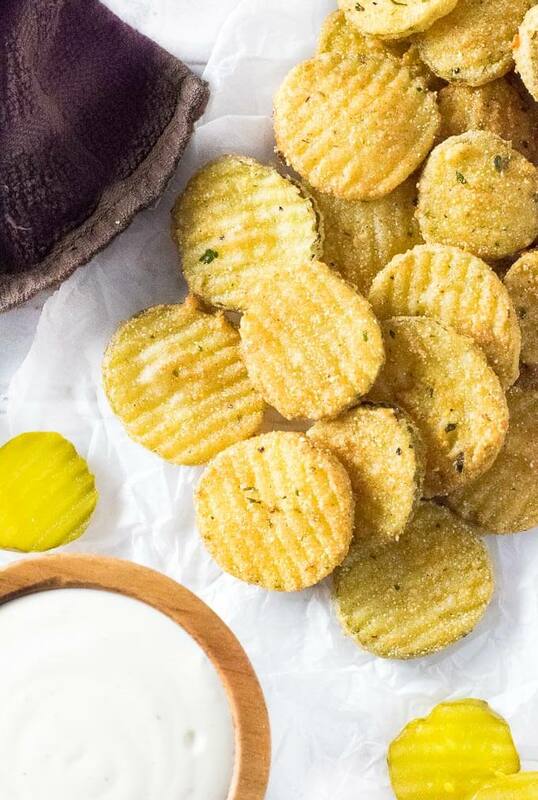 Using ranch seasoning packets provides a subtle tangy flavor that pairs perfectly with dill pickles, while a dash of cayenne lends a great contrast. The cayenne does not make these pickles spicy, but it can be omitted from the recipe nonetheless. Typically dredging your deep fried food in liquid such as milk is required to help the batter adhere. However, I have found this not to be necessary with fried pickles since they are already wet from swimming in the brine. I did try a test batch that was patted dry and soaked in buttermilk, but I found zero difference in flavor. The buttermilk flavor gets lost behind the tanginess of the pickle. Not all pickles are created equal. Inexpensive bargain brand pickles found on the grocery store shelf are often cut thinner from smaller pickles. Not surprisingly, the best pickles for frying are the jarred pickles found in the refrigerated section. They are cut thicker and made from larger pickles, plus they weren’t heated for canning so the pickles are considerably more crisp, which will give your fried pickles much better texture. I find they also have a much brighter, cleaner flavor, which is ideal when deep frying. Using dill pickles is my personal favorite, however, there is no reason why you need to use these exclusively. My half sour pickle recipe would yield a fairly epic fried concoction as well! The best oil for deep frying will have a high smoke point so the oil does not start to burn, which is why olive oil is never recommended for frying. Many people prefer a neutral flavor when deep frying, which is why vegetable oil or canola oil is often used. Canola oil is my personal favorite. Peanut oil is not a neutral tasting oil but does have a very high smoke point. 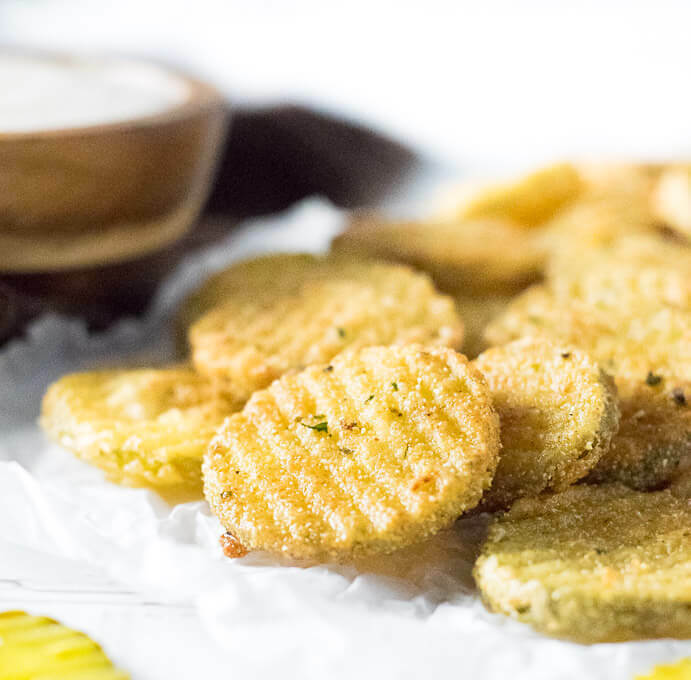 Peanut oil is fantastic to use when the flavor of peanuts pairs well when the food you are frying, such as these fried pickles. My favorite sauce to serve with fried pickles is your basic ranch dressing. However, if you are looking to switch things up a bit, give my comeback sauce recipe a try. Pickles are always a classic pairing with Nashville Hot Chicken too, I would happily use fried pickles to sop up every last drop of that firey sauce. Combine all ingredients for the pickle batter and mix to evenly incorporate. Working in batches, remove pickles from the jar while still wet, and dredge them in batter with a fork, ensuring they are evenly coated. Shake off any excess batter and place in the frying oil. Cook for 90 seconds, or until they turn golden brown. Gently stir and flip during frying to ensure they cook evenly and do not stick together. Serve with ranch dressing or your favorite condiment. IF YOU LIKED THIS RECIPE check out my Homemade Mozzarella Sticks as well!